There was a time in these parts when “W.M.” stood for “West Marin,” but in 1998, Waste Management appropriated the initials for its new, shiny containers which hold our home and yard debris. It now appears that this coast will soon be able to reclaim the abbreviation. These containers are at the foot of Balboa Avenue overlooking White House Pool. 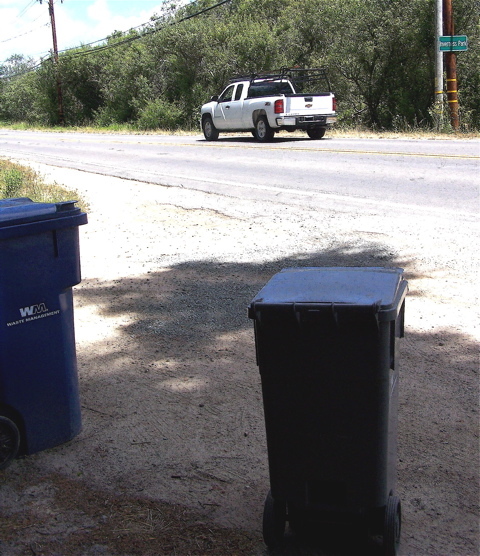 Waste Management of Houston, the conglomerate that for most of July stopped picking up garbage in Oakland and other East Bay cities, may soon stop picking up garbage in West Marin. Here, however, another garbage company is waiting in the wings to take over the conglomerate’s role, so no interruption of service is likely. In short, what’s in the works is not a big change in garbage but a change in Big Garbage. Waste Management has begun preparations to sell its West Marin franchise to James Ratto. A native of Italy, Ratto has been in the garbage business 51 years and has owned or been a significant investor in about three dozen garbage companies around California. He locally runs The Ratto Group of garbage-pickup operations in Sonoma County and is an owner of Fairfax Garbage Disposal and Novato Disposal Service. Waste Management owns garbage companies throughout the United States and Canada, as well as Marin County’s only dump, Redwood Sanitary Landfill in Novato. Waste Management also holds separate franchises from Bolinas Public Utility District and Stinson Beach Water District to pick up garbage in those towns. For more than a month, the boards of both districts have been aware Waste Management wants to sell Ratto the franchises for their towns too. Indeed BPUD’s board was preparing to discuss the pending “sale of assets” this Wednesday night, district manager Jennifer Blackman told me earlier in the day. Meanwhile, non-union garbagemen this past week began carting off some of the mountains of trash that have been steadily rising along streets in Oakland and other East Bay cities since July 2. On that date Waste Management locked out nearly 500 drivers who belong to the Teamsters Union. The Teamsters’ Alameda County contract with the conglomerate ran out June 30, and thus far negotiators for the two sides have been unable to agree on a new contract. Still at issue are pay, pensions, benefits, and worker discipline. Waste Management said it locked out its drivers as a preemptive move lest they strike, but the logic of that gambit escapes me, for the effect is the same either way. The union, in turn, has said its members would rather be driving, but as management’s lockout continued, the Teamsters last Friday began picketing Waste Management’s garbage operations in Sonora and Stockton plus its recycling facility in Walnut Creek. With recycling drivers now staying home in Walnut Creek, Tom Ridder, Waste Management’s district manager here, spent Wednesday driving a truck in that city and was not immediately available for comment on the pending sale. With lettering almost as large as “Inverness Park” on the county roadsign, the Waste Management logo on its debris containers helps frame the gateway to town. The ubiquitous containers have created a leitmotif for West Marin’s scenic roadways. In 1990, the County of Marin gave Shoreline Disposal a 25-year franchise to pick up garbage in West Marin, but Waste Management bought Shoreline in 1998 and took over the franchise. 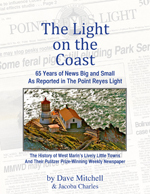 County government then ordered an audit of Shoreline’s books and eventually concluded the company had overcharged West Marin residents by as much as $479,000 in 1997, 1998, and 1999. Waste Management in 1999 negotiated a $244,000 settlement, but the money was not returned to the residents. The county held onto it, with most of the money earmarked for educating residents here about proper disposal of waste. That’s a lot of education. Or waste. The West Marin franchise provides for the garbage hauler’s pickup rates to be reviewed every four years, and this year is that year, Rawles said. The county determines whether the hauler’s recorded costs and revenue are accurate, and if they are, the county allows a 10 percent profit, the DPW deputy director said. He predicted a change in rates and said it is unlikely they will be lowered. In Bolinas, the hauler is annually given a rate increase equivalent to 85 percent of the rise in the federal Consumer Price Index, Blackman said. 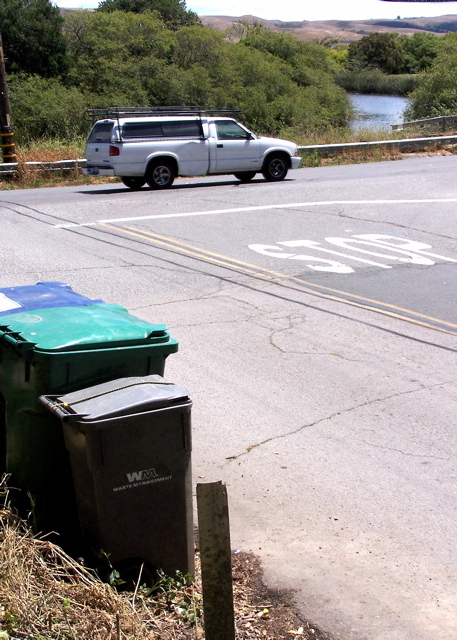 Garbage rates in Bolinas, however, cannot go up by more than 8 percent a year unless BPUD’s board agrees there is an extraordinary need, she added. And then there is the question of how all this affects the West Marin Sanitary Landfill, the Martinelli family’s dump in Point Reyes Station that closed in 1998. In 1996, Ratto argued there should be a transfer station at the dump so that a few large trucks occasionally — rather than several smaller trucks frequently — would transport coastal garbage over the hill. Waste Management would not be selling its West Marin franchise if it were very profitable, and driving up its costs has been the need for garbage trucks from the coast to regularly travel all the way to Redwood Sanitary Landfill north of Novato for unloading. The Martinelli family would still like to have a transfer station at their Tomasini Canyon site. No doubt they could use income from it towards sealing and monitoring the landfill. However, Ratto, 67, is a tough bargainer and sometimes-controversial businessman, and he and the Martinellis several years ago had a falling out. It is, therefore, anyone’s guess as to whether the garbage-company owner would ever resurrect the transfer-station proposal. What is the big deal about a logo on a Garbage can. Somebody has way too much time on their hands. Get a transfer station. It saves time and natural resources. Better yet, incinerate the garbage and start a green waste program out there. I DON’T CARE ABOUT THE LOGOS ON THE GARBAGE CANS. I JUST WISH THEY NEVER WOULD OF MESSED WITH MY DAD’S LANDFILL BUSINESS IN THE FIRST PLACE. I MEAN THE MARTINELLI LANDFILL OR SO-CALLED EMPORIUM, AS MY GRANDPA WOULD SAY. I WISH I COULD HAVE GIVEN THEM A PIECE OF MY MIND. GIVE IT BACK TO MY DAD, LEROY MARTINELLI. Sparsely Sage and Timely is powered by	WordPress 4.9.10 and delivered to you in 0.476 seconds using 52 queries.